Staff is good, some can speak mandarin or english. tuna is fresh, worth the money. Show is good too. Interactive. Speak in Japanese but with a english translation display. Watch professional sushi chefs at work during this tuna cutting show in Shinjuku, which will leave you drooling for some fresh tuna! 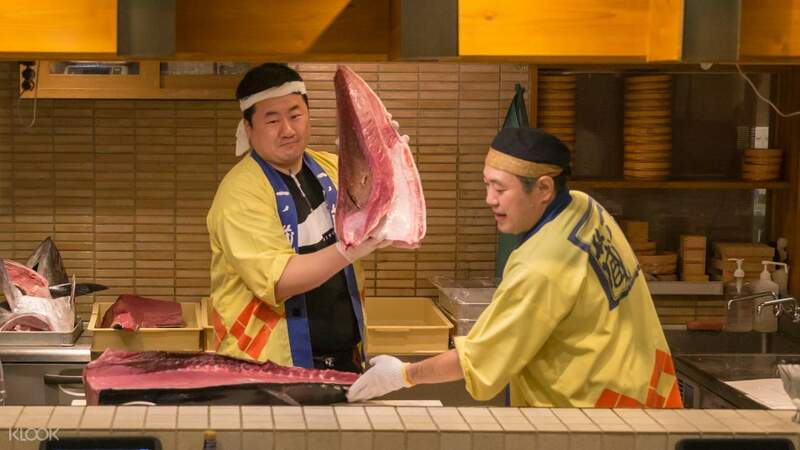 An entire gigantic tuna will be cut into parts such as otoro (fatty tuna in English) and chu-toro (semi-fatty tuna), the delicious parts that end up as sushi on your plate. Once the cutting is done, it's time for "nakaochi" (meat around the bone) scrape! The chef will explain the various parts of the tuna during the process. 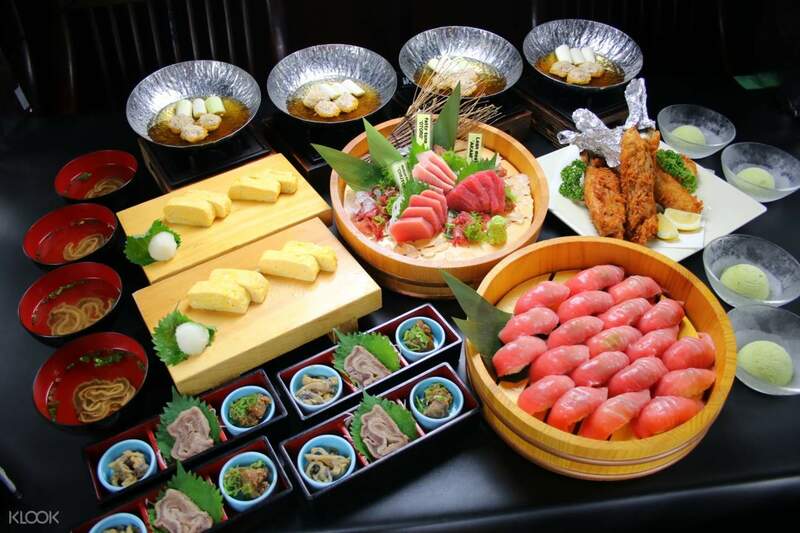 Afterwards, enjoy some great food and drinks that include a special Japanese omelette, deep fried tuna, hot pot, tuna sushi, and matcha ice cream, depending on your package. If you want an intimate look at the world of sushi and sashimi preparation, then this experience is for you! 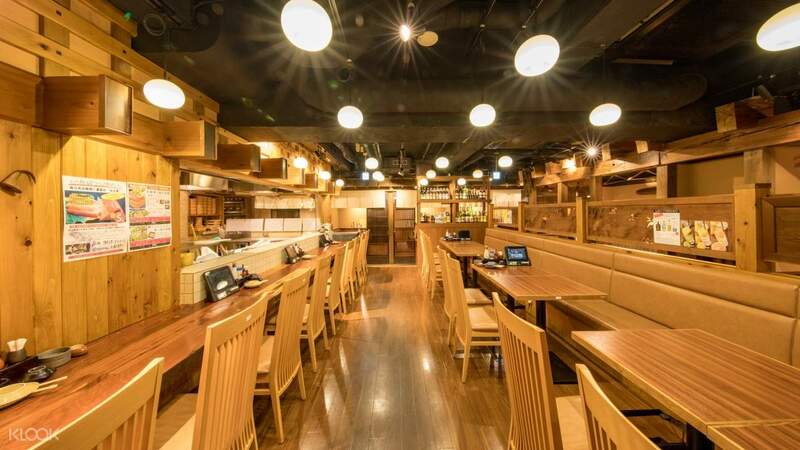 Visit the famous Maguro Shouten, also known as the "Tuna Demolition Show Restaurant"
It was a great experience. The show was conducted in japanese but there were english subtitles too. However, as the subtitles move quite slowly, it was bit difficult to read and focus on the show at the same time. Would rather that you focus on the show instead. The service of the restaurant staff were good too and the food was delicious. Especially love the fried tuna rib (based on what we saw on their menu vis-a-vis what we ate) but there were alot of bones so you need to be careful when eating out. Other than that, would definitely recommend others to try this. It was a great experience. The show was conducted in japanese but there were english subtitles too. However, as the subtitles move quite slowly, it was bit difficult to read and focus on the show at the same time. Would rather that you focus on the show instead. The service of the restaurant staff were good too and the food was delicious. Especially love the fried tuna rib (based on what we saw on their menu vis-a-vis what we ate) but there were alot of bones so you need to be careful when eating out. Other than that, would definitely recommend others to try this. Very entertaining and educating Tuna Cutting Show. Though the English subtitle is not really helping as it runs automatically with no regard to the actual action. 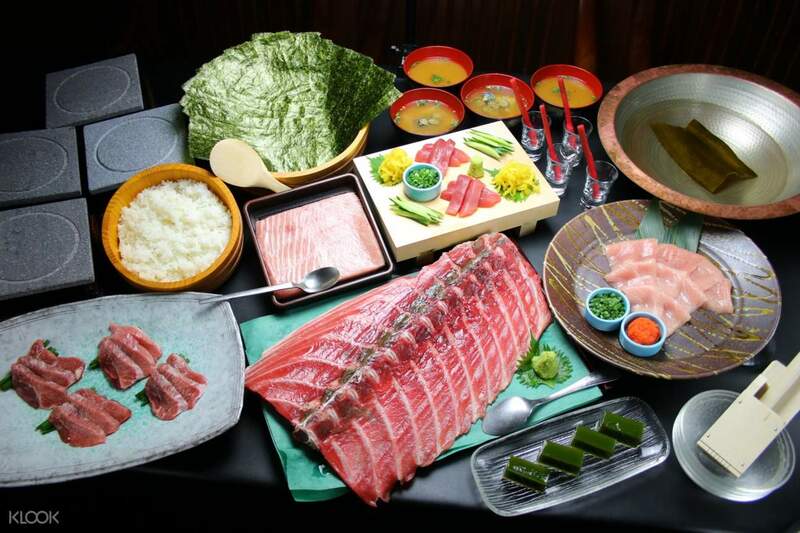 Food wise, the sashimi is superb. But for the soup, we've tasted better. Overall it's pretty interesting if you have some extra time in Tokyo. Very entertaining and educating Tuna Cutting Show. Though the English subtitle is not really helping as it runs automatically with no regard to the actual action. Food wise, the sashimi is superb. But for the soup, we've tasted better. Overall it's pretty interesting if you have some extra time in Tokyo. One of the best dinner we had in japan! Enjoyed the tuna cutting show and there are even subtitles by the side! Dinner was fantastic! Location easy to find too! One of the best dinner we had in japan! Enjoyed the tuna cutting show and there are even subtitles by the side! Dinner was fantastic! Location easy to find too! This is one of the best of all experience. Good food and good show but the only problem is the show is in Japanese language. Overall the best. This is one of the best of all experience. Good food and good show but the only problem is the show is in Japanese language. Overall the best. Staff is good, some can speak mandarin or english. tuna is fresh, worth the money. Show is good too. Interactive. Speak in Japanese but with a english translation display. Staff is good, some can speak mandarin or english. tuna is fresh, worth the money. Show is good too. Interactive. Speak in Japanese but with a english translation display. It was an interesting experience. The staff is very friendly and service is very good. Unfortnately we are too full to finish everthing. Will recommend friends to visit. It was an interesting experience. The staff is very friendly and service is very good. Unfortnately we are too full to finish everthing. Will recommend friends to visit. The show description is not tally with the actual experience—- asked us to be punctual then I booked 6pm , turned out the show is held at 7:30pm which we didn’t know indeed and i am very disappointed !! It all messed up with our own schedule and ended up we left the restaurant without seeing the show! Food is so-so only. The show description is not tally with the actual experience—- asked us to be punctual then I booked 6pm , turned out the show is held at 7:30pm which we didn’t know indeed and i am very disappointed !! It all messed up with our own schedule and ended up we left the restaurant without seeing the show! Food is so-so only. Thank you for choosing Klook and taking time to leave us with a review. Kindly be reminded that there would be detailed terms and conditions for each activity. Please refer to the page - Activity Information to find out more details of the show time. We appreciate your kind understanding and cooperation. Thank you! Thank you for choosing Klook and taking time to leave us with a review. Kindly be reminded that there would be detailed terms and conditions for each activity. Please refer to the page - Activity Information to find out more details of the show time. We appreciate your kind understanding and cooperation. Thank you!